Milan attraction-guides.com - Milan, Italy attractions guide Milan Duomo Cathedral information about attractions, paintings, history, facade, third largest church, stained glass-windows, carved statues, Holy Nail of the Cross, famous Italian artists, location and address, general tourist information about Duomo Cathedral in Milan (Milano) area, Italy (Italia) IT - Last updated 30/10/2012. 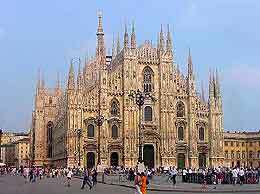 Construction of Milan's grand Duomo Cathedral commenced in 1386 and although the cathedral was consecrated in 1418, Milan's Duomo was not actually finished until the 19th century, when Napoleon finally had the facade completed. Milan's Duomo Cathedral is the third largest church in the world, after St. Peter's and Seville Cathedral, and features many historic attractions and original period features. The cavernous interior of the Duomo Cathedral is full of Milan history and there are roof terraces, with magnificent panoramic views of Milan city. Major attractions at the Duomo Cathedral include the wonderful stained glass-windows, numerous carved statues, the Holy Nail of the Cross and paintings by many leading Italian artists. The nearby Duomo towers, standing high above the Piazza del Duomo square, were named after Milan's famous Duomo Cathedral.